What zone is Bonus time in? I woke up at 2:45am to get my email, and it was charged to my regular time not bonus time. Should be 2-8am local time regardless of time zone, but things happen. For example, if you moved eastward and took your dish with you, it's possible they never updated your local area to the new location. Or, it could just be a mistake. The admins can look into this for you. I see it's your first post here, so welcome to the community! MarkJFine is correct; bonus Time is between 2AM and 8AM, and is dependent upon your own time zone. Please take screenshots of the usage meter, one from just after 2AM and another around 7AM. If we see the AnytimeBytes go down and it is clear that the screenshots are of the meter during bonus time, then I can escalate the issue to the engineers. Also, be sure to include the PC clock in your screenshots so we have timestamps. 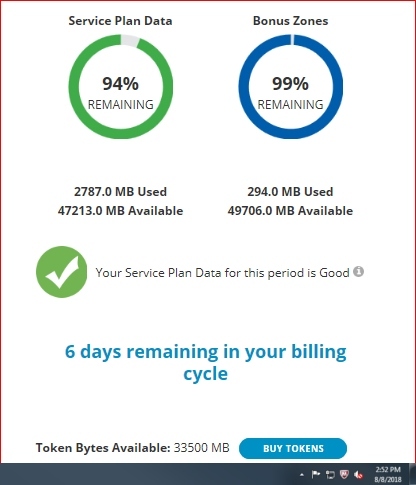 The usage meter can be found at http://my.hughesnet.com . Under My Account, select usage, and there you will see where to access the usage meter.